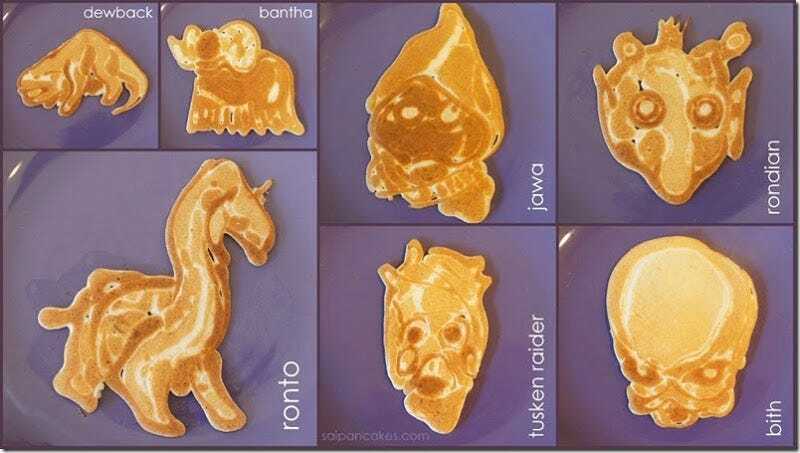 The world's premiere pancake artist Nathan Shields recreates the iconic creatures of the Star Wars universe in heated batter form. How I hate him. Taking requests from his adorable children, recreating faces and artwork after only a quick glance at a picture — he's making the rest of us fathers look bad. My children's two most common words are "pizza" and "ball", so I've got shaped pancakes covered for now, but what happens when they get older and start asking questions and surfing the internet? What do I tell them after years of vaguely circular blobs, when they see this? I guess I'm just going to have to abandon them before my shame comes to light. Thanks a lot, Nathan Shields.